Heading down to New Orleans for LSC’s Innovations in Technology Conference this week? Be sure to be on the lookout for Just-Tech’s Founder and President, John Greiner, and Senior Consultant, Anna Steele. 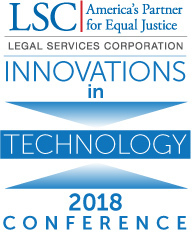 On Tuesday, Anna will be participating in the pre-conference hackathon, and John will be joining members of the legal services technology community in a pre-conference discussion about how the legal services technology community can assist with the ongoing disaster recovery efforts. If you are unable to attend these panels, be sure to say “Hi” in the hallway between sessions or at the conference reception at the Jackson Brewery Millhouse. Click here for the full schedule of conference events, or follow along on Twitter with the conference hashtag #LSCITC.